Rewards Canada: Expedia.ca Black Friday Sale - Extra 75% Off Select Hotels & More. Very limited quantity. 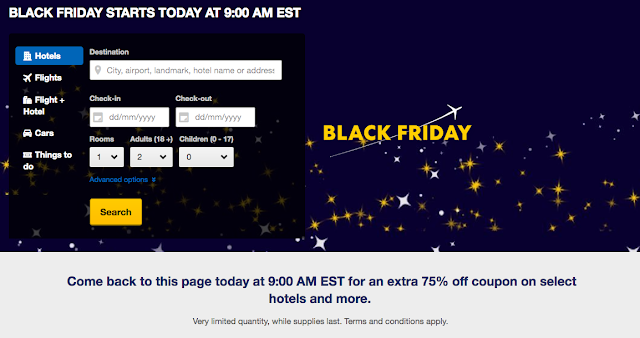 Expedia.ca Black Friday Sale - Extra 75% Off Select Hotels & More. Very limited quantity. In just a few minutes Expedia.ca will have a very limited amount of 75% off coupon codes available to use towards booking hotels via the site! Please note these coupon codes are not available on the app - only on the main website! Once the 75% off coupon codes are gone there will be ones for 50% off + an extra 10% off hotel stays. Those also will be limited in supply so you'll want to make sure you get onto the Expedia.ca site right at 9am ET! Get your Expedia.ca coupon codes right here at 9am ET via this link!